Despite minimal media coverage (and even less positive media coverage) Gary Johnson, the Libertarian presidential nominee, is currently polling between five and seven percent, which is tremendous for a third party. He and his running mate, Bill Weld, make up more executive experience than all the other presidential tickets combined, serving as two term Republican governors in the heavily Democratic states of New Mexico and Massachusetts. Receiving even less media coverage is Allen Buckley, the Libertarian nominee for Senate. Yet, he is polling at around 11 percent among Georgia voters due in most part to his strong grasp on tax policy. There is a myth that if you vote for someone who cannot win, you are wasting your vote. That is especially untrue this election. If you want to see more voices on the stage, getting the Libertarian party to five percent of the popular vote will allow it to compete legitimately in future elections. Whether like me — a Libertarian and Johnson supporter from the time he declared his candidacy — or someone fed up with the current parties, it is not enough to know that there’s someone experienced who isn’t Trump or Clinton. Knowing where Libertarians stand on the issues is essential to aid in a decision to submit the least wasted vote possible. Of all the candidates in this race, the person Johnson sides with most is Bernie Sanders. They both are socially tolerant to the hilt. Libertarians believe that individuals should be able to make whatever choice they want as long as it does not adversely affect others, this includes supporting a woman’s right to choose and marriage equality. In fact, the Libertarian Party had marriage equality written into its platform upon its founding in 1972, far before either of the other larger parties did. Ending the the war on drugs would also serve to open up the freedom to use the relatively tame substance of marijuana, overcoming an unjust racial disparity in arrests due to drugs, and discontinuing the United States’ title of having the largest incarceration rate in the world. Libertarians and Bernie agree on everything from social issues to foreign policy, but they begin to diverge on economic issues. They both want to address the fact that crony capitalism is able to manipulate the government, but seek to handle it in different manners. 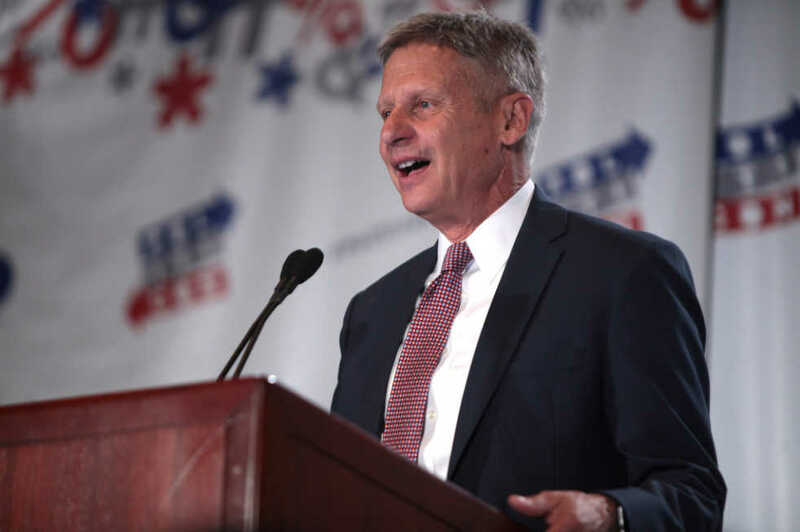 For Johnson and Buckley, it is all about fiscal responsibility. There is a misconception that Libertarians are pro-business, but there is a difference between being pro-free market and pro-business. Under the pro-free market mantra, government cannot be bought and should instead play a role in ensuring that markets remain competitive. But, that is not happening now. Now companies are able to push for regulation and tax exemptions that allow them to increase their dominance while decreasing competition. Through limiting the effects of lobbying and passing regulations that do not stifle the abilities of smaller competitors, Johnson and Buckley can move towards more income equality without breaking the bank. And breaking the bank is a large issue. The national debt is a problem, one that we do not want to address, but one that needs to be addressed. If the debt continues to balloon eventually the government will be unable to pay back bond holders, decreasing the value of a U.S. Bond, and forcing the government to cut back on spending overnight. It has already started. In 2011 the federal government received its first negative rating by a prominent credit union causing the debt to downgrade from a AAA rating to a AA+ and since then, in some cases, it has been dropped to an A-. Instead of allowing the balloon to continue to inflate and burst, we should gradually curb the debt, and this is where Allen Buckley shines. Johnson and Buckley are the only candidates on the Georgia ballot that will decrease spending to ensure a sustainable government, and that comes by making warranted cuts everywhere including the military. There is a reason why Johnson is leading over both Trump and Clinton among the active military. They see the government’s use of the most powerful military in the world as somewhat unjustified. The U.S. has gotten the infamous stereotype as the “world police,” due to the way we have involved ourselves in foreign issues, and the outcome is not warranted. Let us take ISIL as an example. Involving ourselves in regime change in the Middle East has entailed bringing arms into the region and using our war machine to try to stabilize it. But we are not fighting a war of industry like we were in WWII. The conflict only serves to build resentment that translates to recruitment for terrorist groups. Instead of performing drone strikes as was the foreign policy of Clinton or “bombing the s*** out of them” as Trump proposes, we should contain ISIL and let it fizzle out as we lower resentment by showing Syria that we want to work with them through trade and diplomacy rather than war. Libertarians are also for free trade, and that includes the free trade of labor. As a former border-state governor, Johnson understands how crazy the Trump wall is and embraces immigration. If people want to come into the U.S. to work, it should be easy to get a work visa which entails and background check and social security card so that taxes get paid. It’s time to stop treating immigrants as a scapegoat for our problems. Trump complains about the election being rigged. He’s right, but it’s not rigged against him, it’s rigged against the third parties. While the Libertarian party has been able to get presidential ballot access in all 50 states, the restrictions on ballot access still make it hard to get Libertarians on the ballot for more local races. Additionally, the Commission for Presidential Debates is made up of Republicans and Democrats. They set the threshold for being on the debate stage at 15 percent which is simply a disguised way of saying that third parties are not allowed. If Johnson had been allowed on the debate state, we might be seeing a very different election right now. Every election to two major parties will make the argument that you shouldn’t vote for a third party because they cannot win. Do not keep falling for this. Gaining prominence as a party is an iterative process, and if you help the Libertarian party make it to five percent of the popular vote, they will receive retroactive federal funding for the 2016 election, federal funding for the 2020 election and easier ballot access. In most cases, the popular vote doesn’t matter. We live in Georgia which will probably vote Republican. But, if you vote Libertarian, your vote matters more than it possibly could because it is the popular vote that determines the resources a party receives in coming elections. Do not waste your vote on a candidate that you dislike just to stop someone you hate. On November 8th, vote for Gary Johnson and Allen Buckley. Vote for social tolerance. Vote for fiscal responsibility. But, most importantly, vote for a less polarized government where more opinions can be discussed.